Coventry City FC and stadium operators at Ricoh Arena confirmed both parties have agreed terms of the club’s return to Ricoh Arena. 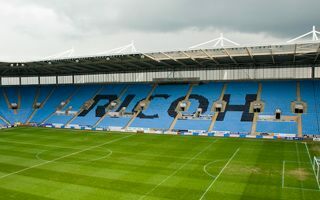 The year-long relocation to Northampton is finally over and new contract will see CCFC play at The Ricoh for at least 2 years, possibly 4. While financial details haven’t been revealed, the Sept 5 match against Gillingham will already be played at home. Steven Pressley, manager of the team, urges supporters to turn out in numbers, but this kind of appeal doesn’t seem necessary. Supporters are already celebrating what the Sky Blue Trust call a “victory of common sense and fan power”. In recent months they’ve been campaigning intensively to bring their beloved club back from Sixfields Stadium, where attendances have plummeted by nearly 80%. Steve Waggott, development director at Coventry City FC, said: “Logistically, it’s going to mean a huge amount of work between now and the first game back and we would ask supporters to bear with us as all of our efforts up to now have been in getting this deal over the line to get us back to Coventry as soon as possible”. The club has suspended all ticket sales and the system is now being re-oriented to offer seats at Ricoh Arena.